When I woke up this morning, I couldn't remember at first why I was so happy? And then it came back to me.....ahhhh, yes......the walking foot! Behold the ugly puckering, behold the holes in all their horrific defiance! Frustrated, I fished around for advice from a friend (thanks Johanna!) and from the lovely lady who sold me my machine. Maybe a walking foot? 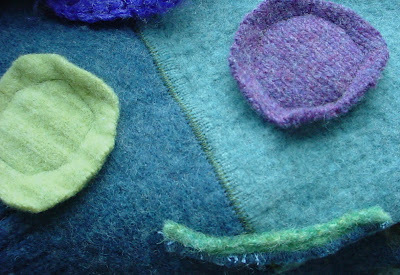 Yesterday Safiya and I sat at the machine for an hour, just sewing scraps of felt together for the fun of it. This morning she wanted to make a blanket for her doll. Before breakfast. Compared to before, it went sooo much faster. And easier. And look, look at the seams! It is ridiculous how happy I am about this.